Concept: Dying languages: Scientists believe that every 14 days an ancient and forgotten language is gone forever. As many as half of the world’s 7,000 languages are expected to be extinct by the end of this century. When Ouma Aenki Kassie, a wrinkled elderly woman, died in Upington, South Africa, she left a rare and endangered language teetering on the edge of extinction. Kassie, who died in January, was one of the last speakers of the N|uu language, listed as “critically endangered” by UNESCO. With her death, there are perhaps seven people in the world who speak N|uu. Endangered languages, much like endangered species of plants or animals, are on the brink of extinction. According to UNESCO, a language is endangered when parents are no longer teaching it to their children and it is no longer being used in everyday life. A language is considered nearly extinct when it is spoken by only a few elderly native speakers. 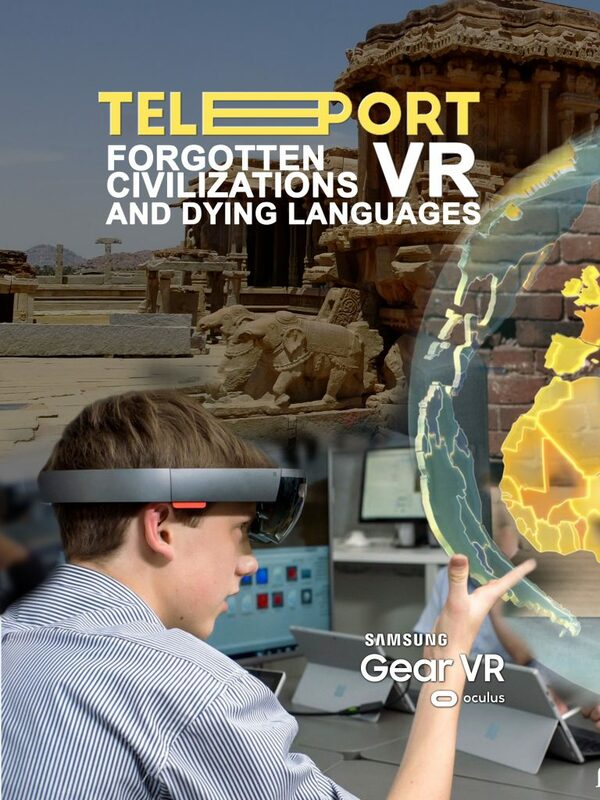 With Teleport VR, imagine being able to travel to some of the most historically important and visually stunning places and hear first-hand endangered languages. No only to listen, but to see visual representations of what that individual is saying through correlating writing and imagery in Virtual Reality. Students will be transported to these exotic locations instantly utilizing state-of-the-art 360 cameras, hardware and software. A viewer will start from a spinning 3D global map and be able to select various locations around the globe. Once a location is selected, the highlighted experience will start. * The viewer will be able to interact with elements which will highlight various aspects about why this language is endangered and provide insights on how it is spoken. * Viewers can hear and repeat words of that language and try to match characters which will “float” above to teach them the fundamentals of that language. * The viewer will be scored based on how well they can answer questions about this language to see how much information they have retained. * Scoring A.I algorithms will be used to adjust each additional experience the viewer undertakes. Learning from that viewers preferences are based on where they look in the experience and items they interact with and order they interact with them. * There will be a Virtual Reality version built to work on Google Cardboard or Samsung Gear VR Devices. interactive elements will be “hotspots” using X/Y coordinates selected by a viewer in the 360 spaces at a given time during each video experience. 1. The filming of 360 VR footage as well collecting images, video and audio for the interactive elements. 2. Programming a VR mobile app version for Google Cardboard and Samsung Gear VR. 3. Acquiring the language’s basic structure to create a virtual reality lesson.